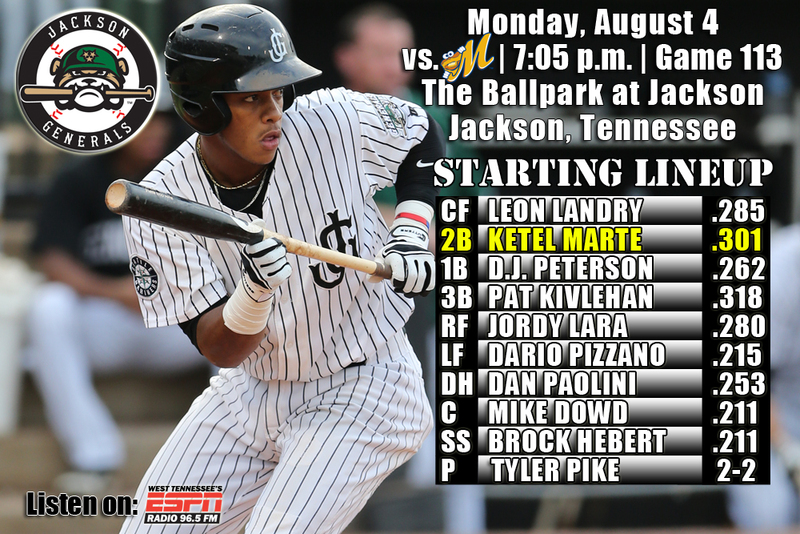 • With the series even at 2-2, the Generals play the rubber match of the 5-game series with Montgomery at The Ballpark at Jackson…the Generals are 4-5 in rubber matches of a series this season…the Generals have won 3 of the last 5 series and won 4 of 5 in last homestand vs. Huntsville…dropped 4 of 5 on recent road trip to Mobile. • SS Ketel Marte, 3B D.J. Peterson, 1B Patrick Kivlehan and DH Dan Paolini each homered as Jackson defeated Montgomery 12-3 on Sunday. RF Jordy Lara (3×4, 2 R, B, RBI, BB) led the team with 3 hits, while Marte (2×5, 2 R, HR, 3 RBI), Peterson (2×5, 2 R, 2B, 2 RBI, Kivlehan (2×3, 2 R, HR, RBI, 2 BB, SB), Paolini (2×5, 2 R, HR, 3 RBI and 2B Patrick Brady (2×4, R, RBI) each recorded multi-hit efforts. • Starter Victor Sanchez (6.2,8,3,3,1,6) earned his 6th win of the season, allowing 3 runs on 8 hits over 6.2 innings. LH Nick Hill (1.0,1,0,0,0,3) and RH Richard Vargas (1.1,0,0,0,0,0) combined to hold the biscuits scoreless over the final 2.1 innings in relief. • After recording 1 hit in his first 14 Double-A at-bats (.071), OF Jordy Lara his hit safely in each of his last 3 games, batting .545 (6×11) with 2 runs scored, 2 doubles, 3 RBI and 1 walk. Overall Lara is batting .280 (7×25) with 3 runs scored, 3 doubles, 3 RBI and 4 walks in 7 games with Jackson. • OF Leon Landry has hit safely in 6 of his last 7 games, batting .344 (11×32) with 6 runs scored, 2 doubles, 2 triples, 2 RBI, 2 walks and 1 stolen base. Since May 16, Landry has hit safely in 55 of 64 games, batting .337 (86×255) with 42 runs scoed, 17 doubles, 6 triples, 1 home run, 20 RBI, 10 walks and 18 stolen bases. During this 64-game stretch he has raised his season average from .155 to .285. • INF/OF Patrick Kivlehan currently ranks T-1st in the Southern League in batting (.318) and 3rd in slugging percentage (.523). Kivlehan also ranks 7th in the M’s organization in average (.305), 4th in HR (18) and 2nd in RBI (90). • SS Ketel Marte currently ranks 6th in the league batting (.300), 1st in hits (127), 1st in at-bats (422) and T-5th in doubles (26). • Interesting Season Series with Biscuits Wraps Up – The Generals are 6-8 this season against Montgomery and 4-5 in Jackson…the Generals are batting .279 with 11 home runs, 29 doubles, 5 triples and 77 runs scored in 14 games. • The Biscuits have a .264 batting average, with 16 homers and 75 runs scored against Jackson this season in 14 games played. • 9 of the 14 meetings between Jackson and Montgomery this season have been decided by 4 or more runs with the average margin of victory being 5.0, but there have been 3 1-run games. • Extra Base Success – Thursday, Leon Landry collected his 6th triple of the season which was Jackson’s 40th as a team, which ranks 2nd in the league. Last season Jackson had 41 through the entire season…Jackson also ranks 3rd in the league in doubles with 204 on the season. • Relieving Guaipe – RHP Mayckol Guaipe has a 2.36 ERA in 30 games this season, with 44 strikeouts… ranks 3rd among SL relievers having just walked 8 batters in 45.2 IP…he also ranks 2nd in fewest baserunners/9IP ratio at 8.47 (43/45.2 IP). • Landry is the toughest in the league to strikeout – OF Leon Landry is 1st in the Southern League in fewest strikeouts, fanning just once in every 9.37 at-bats. • Summer of Hitting – The Generals are leading the Southern League in batting since June 1st, batting .280 (526/1,877) with 35 home runs, 108 doubles and 25 triples in 56 games. • INF Patrick Kivlehan has hit safely in 15 of his last 18 games, batting .369 (24×65) with 12 runs scored, 6 doubles, 3 triples, 3 home runs, 15 RBI and 12 walks. He also has hit safely in 20 of his last 24 games (since 7/8), batting .368 (32×87) with 18 runs scored, 7 doubles, 4 triples, 4 home runs, 20 RBI and 14 walks.